These Enchiladas are a staple in my house. They're a nice alternative to Taco Tuesday (also a staple in my house). The recipe is versatile in the sense that you can interchange beef for chicken or bean and cheese quite easily. This recipe is also super easy to double in case you want to freeze a tray for later or give to a friend, which I often do. Serve them up with a margarita and a fresh salad and you're good to go. 1 lb of either ground beef, ground turkey, or diced or shredded chicken. If you use chicken, might I suggest using boneless, skinless, chicken thighs. I find they add a juiciness you can’t get from chicken breasts. Spray a 13x9 pan with non-stick cooking spray. In a large sauce pan over medium low heat, sauté the onion and garlic cloves until soft, about 3-5 minutes. Add the can of green chiles. Sprinkle the onion mixture with the sugar, cumin, salt, and chili powder. Add the can of tomato sauce to the onion mixture and let simmer at least 15 minutes. While the sauce is simmering, brown the beef, chicken, or turkey in another sauté pan and season with the remaining cumin, chili powder, and salt. Either with an immersion blender or a tall blender, puree the tomato based enchilada sauce. Pour about a cup of the enchilada sauce into the pan with the beef, chicken, or turkey and bring to a simmer. Add four ounces of the shredded cheese to this mix and stir. To warm the tortillas, I like to place a few at a time in between two damp paper towels and microwave on a microwaveable safe plate for 30 seconds. Note: I wouldn’t try to microwave 3-4 at a time, as the tortillas won’t become as pliable as you would like. Add a half a cup of enchilada sauce on the bottom of your pan and spread evenly. Place about a ¼ a cup of mixture in each tortilla, evenly down the center, then wrap and place them seem side down on the non-stick sprayed pan. Repeat until all tortillas are filled with the enchilada mix. Pour some of the remaining enchilada sauce on top of the enchiladas. The amount varies, usually about a cups worth. Then sprinkle the remaining cheese all over the enchiladas. Spray aluminum foil with non stick spray and place on the tray of enchiladas, spray side down so that it is facing the enchiladas. Place in the preheated oven for 15 minutes, covered, and then remove the aluminum foil and cook for an addition 5 minutes, until cheese is melting and browned. 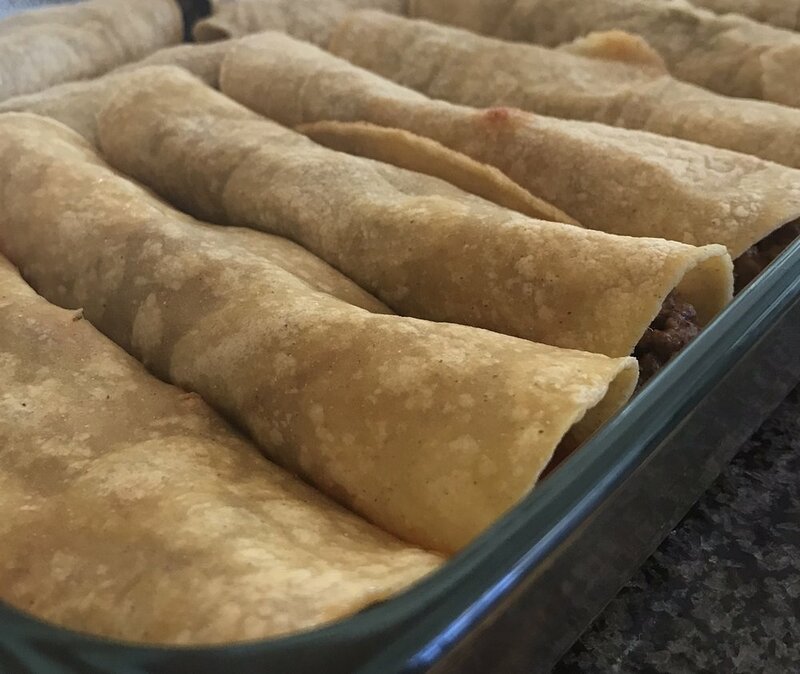 These enchiladas travel very well and are a great dinner to bring to someone who needs a meal such as an under the weather neighbor, a friend or family member who just welcomed a baby, or just for you, and 5 of your closest friends or family.